The United States’ flag has had some tough times lately. Colin Kaepernick caused an uproar among many conservatives when he began to kneel during the national anthem. Kaepernick claims he kneels for patriotic reasons. The flag symbolizes “freedom and justice for all.” He kneels to bring attention to the fact that systemic racism means that not all people in the United States experience freedom and justice. But as mimetic theory teaches us, accusations are imitative. When one person accuses someone of a sin, you can be sure that person will soon be accused of a similar sin. And that’s exactly what happened to Donald Trump last week when he met with Kim Jong Un in their historic summit. Time will tell if President Trump is a daring peacemaker or a fool who has simply given a dictator a more prominent place at the world-wide table. As Trump and Kim shook hands, the US and the North Korean flag stood side by side in the background. The flags look very similar. They are both red, white, and blue. Both have stripes. And both prominently display the star pattern. A summit is not an accomplishment for the American President…It is a major accomplishment for Kim Jong Un. 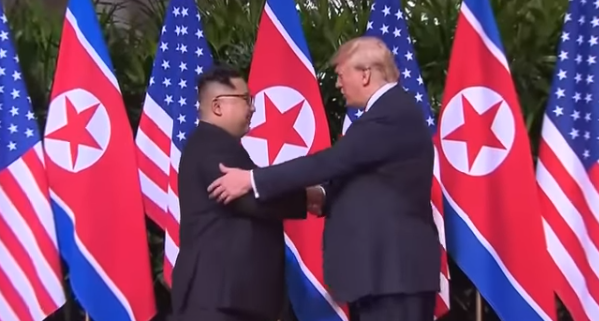 In fact, the spectacle of seeing the American flag along with the DPRK flag as the backdrop for that handshake is really jarring actually to see, to witness. In fact, I would say it’s somewhat disgusting. It is actually a debasement of the American flag. This is a despotic regime that murders its own citizens and so we’re putting him on the same stage as the American president. Let’s not forget the big picture here…which is [that] the United States is the most important bastion of freedom in the world. North Korea is the most important bastion of repression. It is a prison state. It is a police state. And we have elevated that police state. We have elevated that dictator by putting him on the same stage as the America president. I want to be clear that I love the United States. I love my country’s ideals of freedom, liberty and justice for all. But Bash is wrong. If Americans were to take a long look at ourselves, we would see the uncomfortable truth that we accusation, Colin Kaepernick, donald trum, Kim Jong-un, prison industrial complex, united states’ flag have more in common with North Korea than we would like to admit. The prison industrial complex has increased dramatically in the last ten years. Just a decade ago there were only five private prisons with a total of 2,000 inmates. Today there are 100 private prisons with 62,000 inmates. That dramatic increase in private prisons has occurred while the number of violent crimes in the United States actually fell 48% from between 1993-2016. The private contracting of prisoners for work fosters incentives to lock people up. Prisons depend on this income. Corporate stockholders who make money off prisoners’ work lobby for longer sentences, in order to expand their workforce. The system feeds itself. The prison industrial complex is the American form of repression and NFL players are rightly protesting. The American flag isn’t being desecrated by standing next to the North Korean flag. The American flag is desecrated by the racism of the prison industrial complex. Like Bash, we can accuse North Korea of being repressive against its own people. But to accuse North Korea of its atrocities should not blind us to our own similar repressive practices against our own people.